Now in our 15th year, the 6 Grasswren tour continues to be one of our most popular outback birding tours. This is one of Australia’s epic birding adventures, during which we search for half of all of Australia’s current Grasswren species. This fast-paced trip is not for the faint-hearted, with lots of walking in sometimes difficult terrain, early departures and late finishes each day, while covering over 2500 km in 7 days. We may encounter harsh outback conditions such as extreme heat, frosty mornings, torrential rain or dust-storms. The accommodation is in basic rooms often with no private facilities. 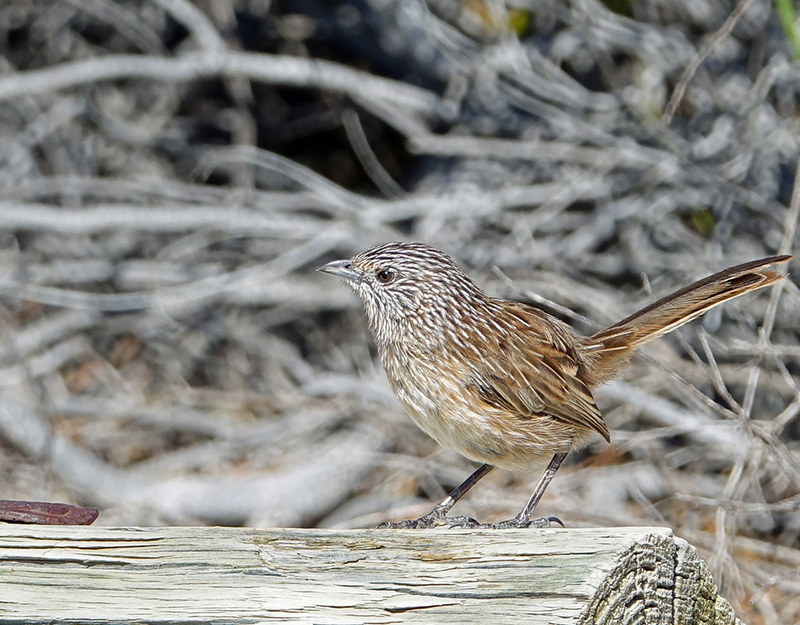 However the rewards are some of Australia’s hardest to find, yet most sought-after species: Grey, Striated, Short-tailed, Thickbilled, Western and Eyrean Grasswren. We will travel through exceptionally remote areas including the 1,000,000 ha of Bookmark Biosphere eucalypt mallee scrub (including Birdlife’s Gluepot Reserve), spectacular rock formations on the edge of the outback in the Flinders Ranges, white and red sand dunes of the vast Strzelecki desert, endless stony ‘gibber’ plains and the Bulloo river overflow. In addition to the Grasswrens, time will also be spent searching for other good species such as Bourke’s Parrot, Red-lored Whistler, Blackeared Miner, chats, Honeyeaters including Pied and Greyfronted; Banded and Chestnut-breasted Whiteface, Chestnut and Cinnamon Quail-thrush, Gibberbird and more. Some years we see Letter-winged Kites and Flock Bronzewings on this tour – their presenceepends on preceding rainfall.